After checking your status, you will be listed in one of the following categories. If your status is “No Record Found,” the Governor hasn’t yet restored your voting rights. Have you changed your name? Are you sure you entered your correct date of birth? — Or, you can access that same online form by clicking on the red button “Complete Application Form” below. Confused? Call us at 844-932-8683 for free and confidential guidance. If you need help completing the application form, call us at 844-932-8683! If Your Status is listed as “Pending” or "Ineligible"
“Pending,” means the Governor is confirming whether you have completed your sentence. This process usually takes 2-3 weeks to complete. Please contact us at 844-932-8683 if your status has been pending for more than 4 weeks. “Ineligible” means the Governor believes you are not eligible to have your rights restored. The most common reason is that the Governor has determined that you have not fully completed your sentence. If you believe this is incorrect, please contact us at (844) 932-8683. We can help! Congratulations! If your status is “Granted,” that means the Governor has already restored your voting rights! You should receive a personalized restoration order in the mail within two-three weeks of the date the Governor restored your voting rights. If you have not received your restoration order in that timeframe, please contact RMV at 844-932-8683. We can help you figure out why. 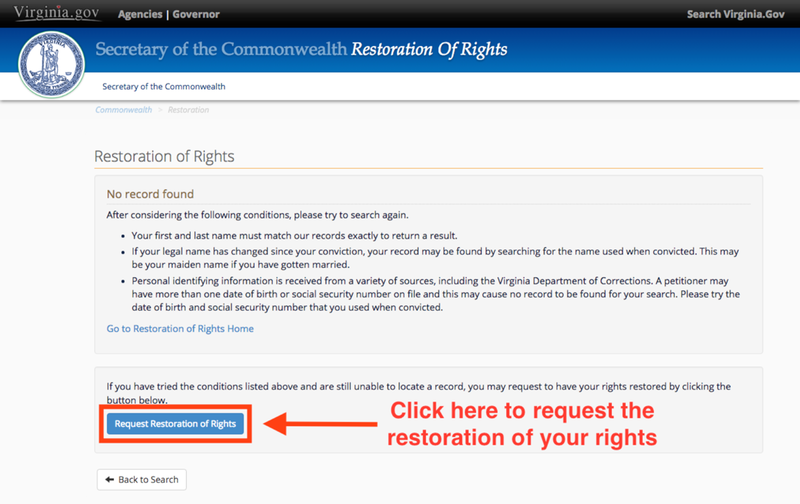 IMPORTANT: Just because the Governor has restored your rights does not mean you can go vote on Election Day! FIRST YOU MUST REGISTER TO VOTE! Voting is easy, but there’s a few things you need to know to make sure it goes smoothly. Click the red “Learn About Voting” button below to get the info you need to Vote in VA!